July 21 earnings update: The Apple Q3 earnings beat expectations, but only barely, disappointing many investors. Despite some very strong year-over-year numbers, Apple stock fell as much as 8% in after-hours trading. AAPL's earnings per share of $1.85 came in above revised forecasts for income of $1.81. Revenue of $49.6 billion just edged expectations for $49.43 billion. Unit sales of the iPhone, however, also barely beat Wall Street forecasts. Apple sold 47.5 million, versus expectations for 47.25 million. Investors may have also been uneasy on Apple guidance. Apple expects revenue of between $49 billion and $51 billion for its Q4. Analysts had been forecasting revenue of $51 billion. Nevertheless, Apple revenue was up 33% over the period a year ago, and profits were up 38%. Sales of the iPhone increased 35%. And Mac sales were up 9%, even while overall PC sales were down 9.5% in the second quarter. Unit sales of the iPad, however, fell 18% year over year. Apple ended the quarter with $203 billion in cash. The Apple Q3 earnings will not only beat expectations, it will smash them. Apple Inc. (Nasdaq: AAPL) is scheduled to report its fiscal Q3 earnings after the market close on Tuesday. And even with expectations rising, the signs point to the Cupertino, Calif.-based tech giant stunning Wall Street (again). Investors apparently are sensing an Apple Q3 earnings beat. Since dipping to $120.07 on July 9, AAPL stock is up 6% to $129.40. The main reason, of course, is that sales of the iPhone 6 – which have remained strong even nine months after its debut – will far exceed the analyst consensus. 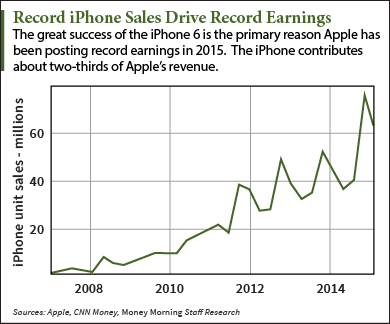 For Apple, the iPhone drives the earnings train. It contributes 64.3% of the company's revenue. The Wall Street consensus is for iPhone sales of about 47 million. But a warning from rival Samsung, and the trend of rising iPhone popularity in the huge Chinese smartphone market, suggests the number will come in significantly higher – past 50 million units. And not only is it likely Apple sold more iPhones in Q3, it sold pricier models than many analysts may have assumed. A just-released Consumer Intelligence Research Partners (CIRP) survey said the number of iPhone buyers opting for the bigger, more expensive iPhone 6 Plus rose to 29% in the June quarter from 22% in the previous quarter. The amount of flash storage rose by 6%, which means more customers bought iPhones with greater memory capacity. Much of the higher price Apple charges for iPhone models with more memory becomes profit. The combination means the Apple Q3 earnings will blow past Wall Street expectations for $1.79 a share on sales of $49.1 billion. UBS analyst Steve Milunovich, who has seen the CIRP numbers, boosted his forecast to $2.00 a share on sales of $52.3 billion. Cannot be q3 earnings, did you mean q2? Despite a low beta, Apple is very volatile in recent years. So, it is subject to unforeseen ups and downs. Manic to some. There is no mention about Apple Watch in the article. Has Apple already written off its NEW product – iWatch ? Also the stock market crash in China recently would translate to lower demand in coming quarter – which has an impact on next quarter earnings? Apple is not breaking out any of the Watch data, so there's nothing to report other than CEO Tim Cook's word that the Watch "exceeded internal expectations." It's hard to say if the Watch is doing well as Apple claims or not so well as some critics have claimed in recent weeks. As for China, Apple continued to see strong growth there in Q3. Revenue from China more than doubled. Cook said Apple "remains extremely bullish" on China despite the stock market slide there, although he said that might cause some "speed bumps." I agree with Cook here. I don't think the volatility in the Chinese stock market will have much impact on Apple sales there. Frankly, the next big challenge for Apple is putting out a must-have successor to the iPhone 6. After the next quarter the comps get a lot tougher.